Swap the traditional turkey for a Bourbon Glazed Ham this Christmas or Thanksgiving! Get the recipe below. I read the other day that 88% of Americans eat turkey on Thanksgiving (Source: National Turkey Federation) and in the UK, 76% of Brits eat turkey at Christmas (Source: British Turkey). That’s an awful lot of roast turkeys! Now don’t get me wrong, I love a moist turkey on Christmas day as much as anyone. And when I cooked my first Thanksgiving dinner for friends last year I did a beautiful turkey crown complete with stuffing, roast potatoes and plenty of veggies. But, this year for Thanksgiving I wanted something different, an alternative to Roast Turkey. 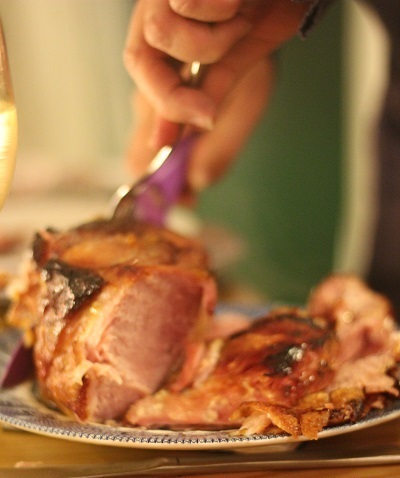 Roast ham is a real crowd pleaser and is quite a traditional roast. Still, if I was going to reinvent Thanksgiving dinner I needed to bring the humble roast ham into the 21st century and jazz it up a bit. I find that if you want to bring a bit of pizazz to a dish, booze often does the trick, so I raided Jon’s whisky collection for an all-American bourbon that I could spike the marmalade glaze with. I also rather ambitiously decided to cook TWO whole pies! I did the classic Pumpkin Pie last year so wanted to try something new. I eventually settled on Pecan Pie and an apple pie because my sister doesn’t like nuts. Overall, I’m pretty pleased with the menu as a whole. The flavours all really complemented each other. I also slipped a couple of spoons of bourbon in the pecan pie to tie-it all together! But, back to the Bourbon Glazed Ham. Although the recipe reads as though this roast takes a lot of effort, It really just involves two steps. First, boil the ham to keep it super moist, then roast in the oven. It really couldn’t be simpler. The glaze on top of this ham is marmalade based. Many other glazes involve honey but I’ve found them just too sweet and they can also catch if you’re not too careful. By using fine cut marmalade you get a thick, juicy glaze that is sweet without detracting from the salty roast ham. A couple of spoons of bourbon help loosen it up so it’s easy to spread and effortlessly melts over the joint. Because the marmalade is thicker than conventional honey based glazes you don’t need to reapply or baste the ham too often making for a simple glazed ham recipe that is fool proof! This Bourbon Glazed Ham is a tasty alternative to turkey at Christmas or Thanksgiving! Place the gammon joint into a large saucepan on the hob. Cover the joint with water, bay leaves, peppercorns and thyme. Juice the orange and add this to the ware before turning on to a moderate heat and bringing to the boil. Let the joint gently simmer for an hour with the lid on. Once an hour is up, turn off the heat and leave to infuse in the pot for half an hour. This is the perfect time to start preparing other side dishes and pre-hating the oven to gas mark 3 (170 degrees). After letting the meat rest in the broth, move over into an oven roasting dish. Remove the skin from the joint and score the fat that is left on the joint in a criss-cross pattern. Season with the salt and pepper, rubbing deep into the grooves. Pop the ham into the oven for 30 minutes, or until the fat has started to become crisp. Mix up the bourbon, rosemary and marmalade and spread roughly half over the meat. Place back into the oven and cook for another 20 mins. Smother the last of the glaze over the meat and baste with a little of the juices in the bottom of the pan. Put the ham back in the oven and cook for another 30 mins until the glaze is sticky and the ham cooked but moist. Serve in the centre of your table and carve. Any leftovers will taste delicious in sandwiches! The house smelled amazing as this was cooking. I managed to time it just right so that as they arrived I had just put the ham into the oven. 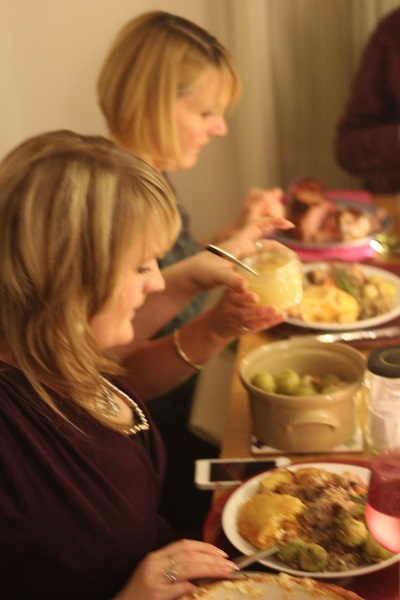 When I served the joint, everyone was asking how I had managed to keep it so juicy and moist! The simmering on the hob before roasting was my little secret – until now. The Bourbon Glazed Ham was so delicious I am glad I chose to break the tradition of eating turkey on Thanksgiving and I’d encourage you to do the same! If you don’t celebrate thanksgiving but do celebrate Christmas and are looking for an alternative Christmas dinner then I’d really recommend cooking a ham. 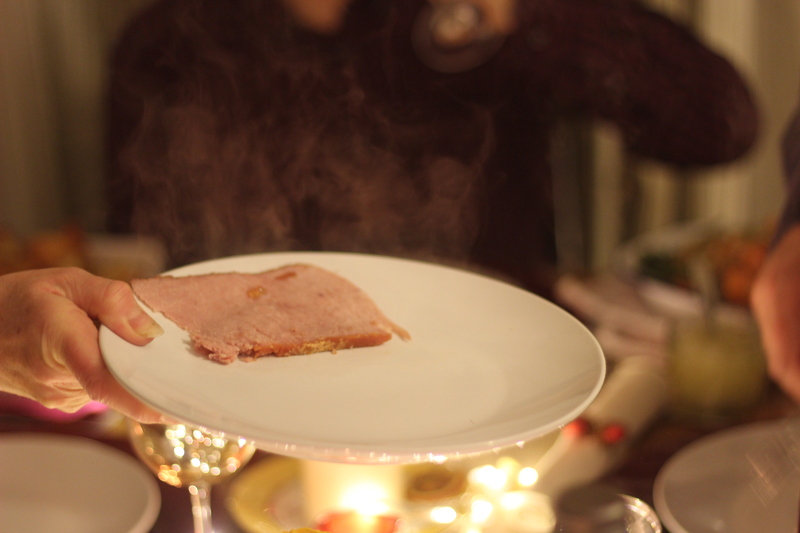 Perhaps Christmas Ham will become your new tradition?! You certainly won’t get told the meat is dry with this recipe. 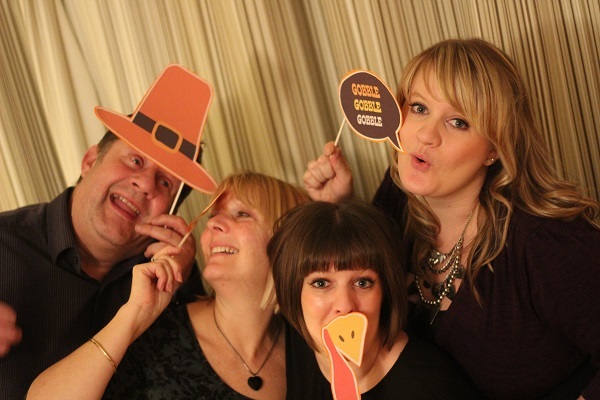 Celebrating thanksgiving with my family this year was really lovely. I know it’s a little unconventional to hijack another country’s traditions but I love the idea of gathering friends and family together just to say thank you! We decided to write down all the things we were thankful for into a jar at the beginning of the meal. While we waited for pudding we then took it in turns to read one out and we had to guess who had written it. All in all we had a fantastic time. I think my sister and Dad are secretly a little worried about cooking their meals now. But at least that;s the pressure off of me for another year. 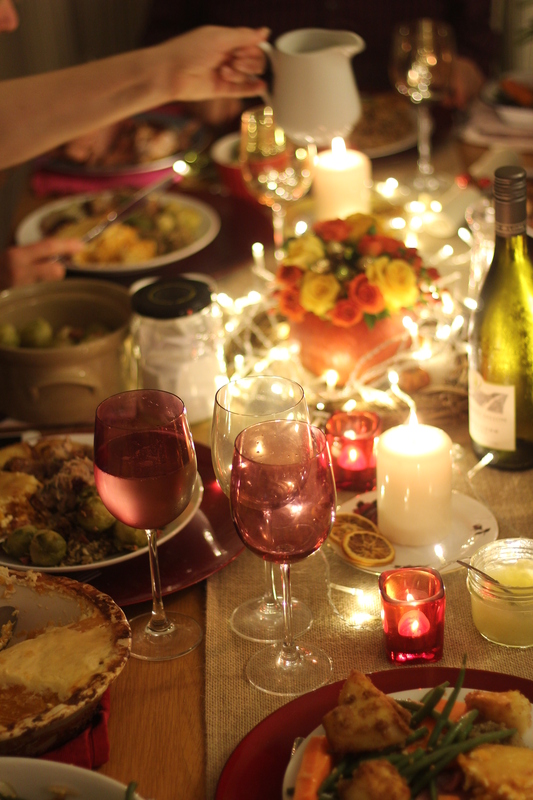 Are you responsible for the main Thanksgiving or Christmas meal? Do you cook turkey every year or do you like to mix it up? I’d love to hear in the comments below! Looks delicious! I like turkey but love ham!